Home » History » How did WWI End ? The First World War, which has become a byword for a static war of attrition, ended in 1918 just as it had begun in 1914, as a mobile war. In addition, and contrary to Marxist mythology, the First World War ended not through mutiny or popular uprising, but through decisive military defeat. 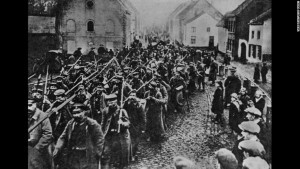 Certainly, the major combatants were exhausted, and their peoples weary of the war, but the only country voluntarily to withdraw from the war was Bolshevik Russia. At the outbreak of war in 1914, and until the end of that year, the war was mostly mobile, with armies all trying to outflank each other in what became known as the race to the sea. However in a world where the fastest way you could move your troops was by train, marching columns or horse – if you wanted to move across country – and where there was an imbalance towards defensive technologies, like the machine gun – the war soon ground to a halt. The ‘race to the sea’, after the first battle of the Marne, in front of Paris became a series of defensive trenches. This static front stayed this way for the next 3 years whilst the Generals learned some hard lessons, at the expense of their men, and during which more offensive, manouverable technologies – like the tank, aeroplane & wireless – all caught up. This coupled with the exhaustion and decimation of the combatants’ populations meant that by 1918 the time was ripe for breaking of the deadlock. 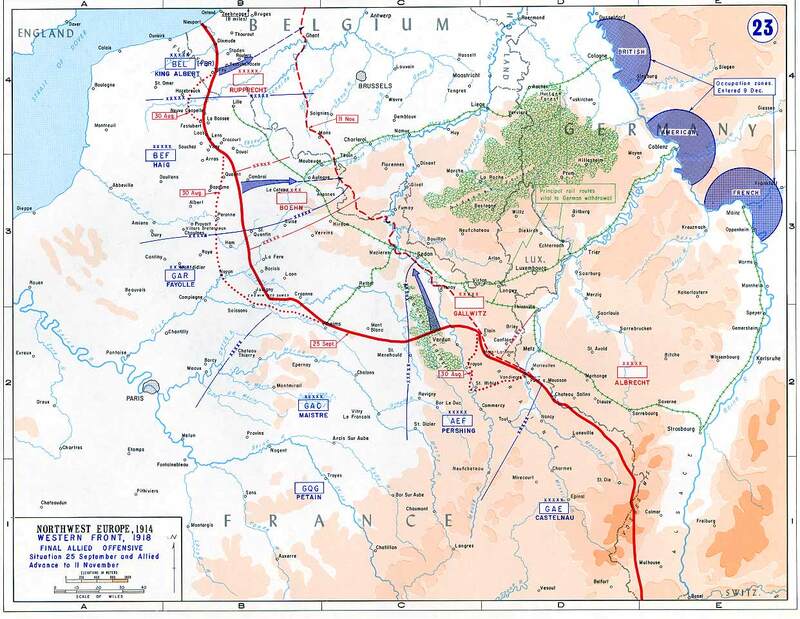 With the capitualtion of Russia in 1917 and the imminent arrival of the fresh American Army into the Western theatre of war, Germany launched its forces into a huge offensive in France in the spring of 1918, breaking the trench deadlock and threatening Paris. 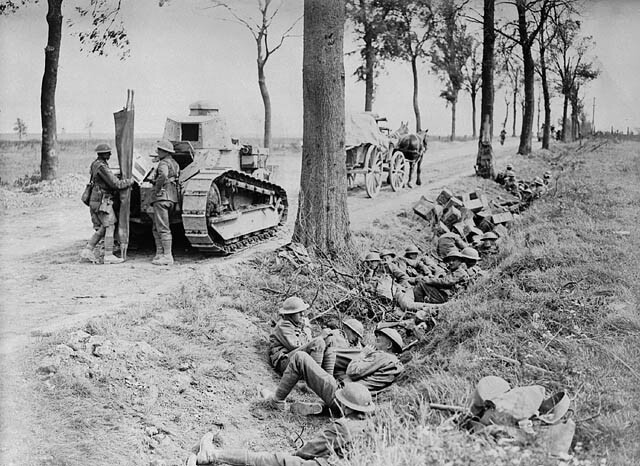 The Allies regrouped, broke the German advance and counter-attacked. 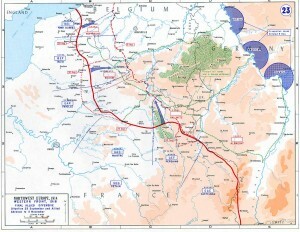 On 8 August, at Amiens, Haig inflicted a devastating defeat on the Germans – German general Erich Ludendorff called it the ‘Black Day of the German Army’. Further heavy defeats followed, and by September both he and Paul von Hindenburg [a senior military figure] were demanding an end to the war. Faced with total defeat, in November the Germans forced the Kaiser to abdicate and declared a republic, which then asked for an armistice. It is difficult to conceive that this would have happened had Germany not been crushed on the battlefield. ‘Stabbed in the back’ ? 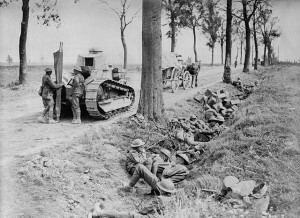 1st October 1918: The defeated German army struggling homeward following the Armistice. Certainly the years of privation and heavy looses caused the German Navy to mutiny and by early November 1918, many cities had been taken over by workers’ and soldiers’ councils but they were soon repressed. 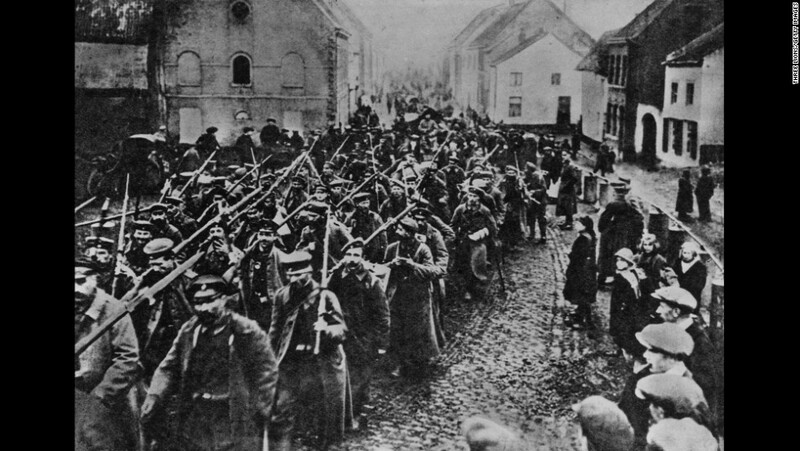 The irony is that because an armistice was declared before the Allies reached German soil, to save further lives, and because much of the German Army marched back in tact, with their arms, to their homeland, this led to the belief that they were ‘stabbed in the back’ by their leaders and could have continued fighting. This myth would fester in the German collective consciousness and would ultimately contribute to a second and even more destructive Second World War.